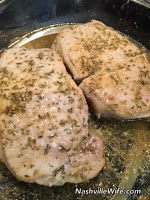 Last week, one of my readers asked if I have a good pork chop recipe, and I do! This is my go-to meal when I’m looking for something simple and tasty. I’ll often throw it in the oven along with some veggies and then do at-home exercises while it cooks. Gotta love efficiency! *I use center-cut chops or boneless chops that are about ¾-inch thick. Grease bottom of baking dish with olive oil (I use a glass pan) and add 3 Tablespoons of water to keep pork chops moist. Sprinkle both sides of pork chops with spices and a small amount of soy sauce (about 4 drops per side). Lay pork chops flat in baking dish, and bake at 350F for 20-25 minutes (depending on the thickness), pulling them out of the oven to flip halfway through. The tricky part is that the outsides can look perfectly moist while the insides are already dry. 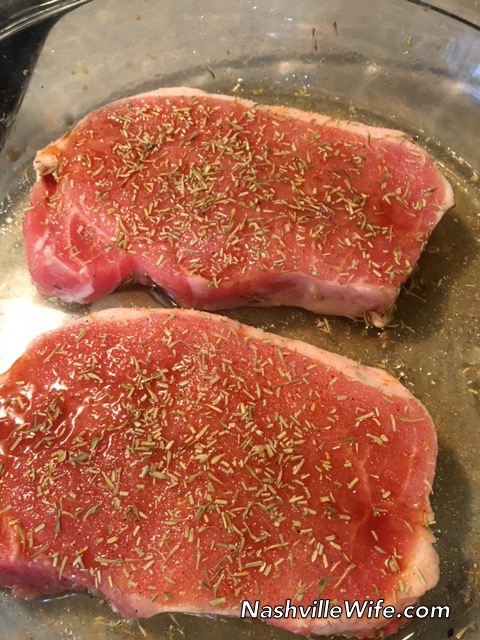 The USDA recommends that pork chops be cooked to an internal temperature of 145F, although I’ll admit that I rarely use a thermometer for this recipe anymore.